The dei Rustici Theatre of Monteleone d'Orvieto (TR), which takes its name to the fact that was the Accademia Filodrammatica dei Rustici's home and was active since 1732, is considered one of the smallest in the world (by the way, there is a little dispute with della Concordia Theatre of Monte Castello di Vibio on what is "The smallest theater in the world", ed), is ready with its 2012 Theatre Season organized in collaboration with U.I.L.T. (Italian Union Free Theatre) Umbria. 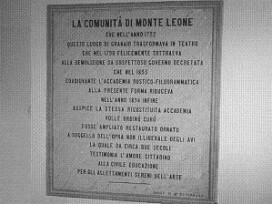 The Season, called "Monteleone a Teatro", is an amateur theater festival now in its 17th edition and will be of 7 appointments, the first January 29th, 2012 with "Sogno di una notte di mezza sbornia" ("Dream of a night of mid-booze-up") by Eduardo de Filippo. Directed by Graziano Petrini and brought on stage by I Clitunnali theatre company. Closing entrusted to the Conservatorio Teatrale La Scaletta of Roma which will perform March 25th, 2012 with a show connected to the World Theatre Day. All shows will be on Sunday and will start at 17:00. Subscriptions cost € 30,00 (and reserved seat for the shows on the bill), ticket € 6,00. For the over 70s the subscription will cost € 25,00 and € 5.00 the ticket. For under 16s subscriptions € 20,00 and tickets € 4.00. Subscriptions and tickets booked at the Municipality of Monteleone d'Orvieto, tel. +39 0763 834021.